Glenn Hughes says that he has no interest in performing DEEP PURPLE's classic songs with the current version of the group. 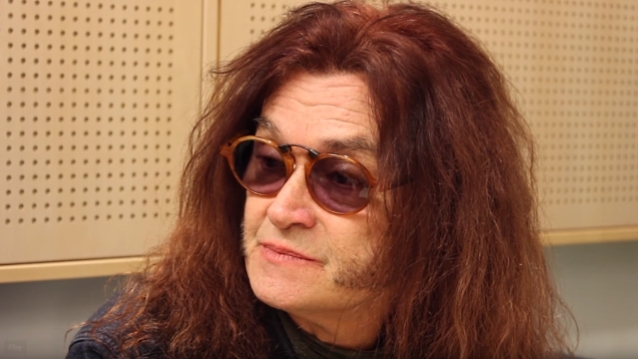 Asked in a brand new interview with Finland's Kaaos TV if he would accept a hypothetical invitation from the current DEEP PURPLE lineup to sing at one or more shows during the band's "The Long Goodbye" tour, Hughes said (see video below): "No. I'm doing what I'm doing now. I'm really, really happy playing these songs with my band, and the audiences are very, very happy. We've had great attendances across the world, so I'm really happy about doing that." Hughes said that he had never done a "complete DEEP PURPLE show" prior to "Glenn Hughes Performs Classic Deep Purple Live". "For me to do these songs, I had to step back into character," he explained. "I grew my hair again and kind of look '70s. It's not like I'm a nostalgia artist, but in order to do this, I wanted to recreate the look and the vibe and the sound of what it was like in the '70s. I wanted to become an actor, if you will, to do what I do. This is the way I like to look at music — to become an actor and to make the songs come alive." He added: "You can't hide the fact that I was in one of the greatest bands of all time. And I just think I had to be in the right frame of mind to do it. You can't do this unless you're in the mindset, in the vibe and the smell and the feel. It has to be appropriate. I didn't wanna phone in my vocals. I wanna give everything I can to the audience, so they'll look and go, 'We want more of this.' So that's why I'm doing it." Hughes and his former DEEP PURPLE bandmate David Coverdale didn't perform with the group at their Rock And Roll Hall Of Fame induction in April 2016. Hughes later explained to Metal-Rules.com: "There is a band out there called DEEP PURPLE featuring Ian Paice, Ian Gillan, Roger Glover which was essentially Mach 2. Every artist gets to do three songs. Now let me talk to you openly as there was a 99.9 percent chance that Hughes and Coverdale would not be invited to sing. I'm not going to name names, as there is a member who didn't feel it was appropriate that we should sing. So David and I braved it together as we were arm and arm all the way through. But I knew by the end of the night it would not happen. CHEAP TRICK closed the show and they invited us to play with Sheryl Crow and Grace Potter." Hughes denied that he bothered by the fact that he didn't end up performing with PURPLE at the event. "Am I upset about not singing with DEEP PURPLE? Not at all," he said. "Everybody knows that David and I can sing. Everybody knows that we were in the band. All that mattered to me was accepting the award on behalf of DEEP PURPLE and the fans." During the "Glenn Hughes Performs Classic Deep Purple Live" tour, Glenn and his band, featuring Søren Andersen (guitars), Mike Mangan (keys), and Ash Sheehan (drums), focus on arrangements from the live albums — not studio recordings — for the classic PURPLE songs.